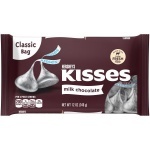 Hershey's Special Dark Kisses Chocolate. They are made from sugar, chocolate and cocoa butter for a luscious dark chocolate flavor that melts in your mouth. The Hershey dark chocolate is a natural source of cocoa flavanol antioxidants. Ingredients: Sweet Chocolate(Sugar, Chocolate, Cocoa Butter, Cocoa Processed With Alkali, Milk Fat, Lactose, Soy Lecithin and Pgpr Emulsifiers, Vanillin, Artificial Flavor and Milk).